The second of the churchy books I've been tasked with reading deals with a question that is really quite significant. The question is: "How do you deal with conflict?" This is a big one. As much as we'd like to imagine that church is where we all gather around to eat buttered crumpets and be kind and sing happy Jesus songs, the reality is that managing disagreement is an absolutely vital skillset. If you are somewhat conflict-averse, or have approaches to conflict that aren't constructive, then Bad Things will happen to you. That's true in life, and it's really most sincerely true if you lead a congregation. Having just watched point blank range as a congregation with a dysfunctional approach to conflict blew itself to pieces, I can attest to the importance of knowing how to deal with disagreement. 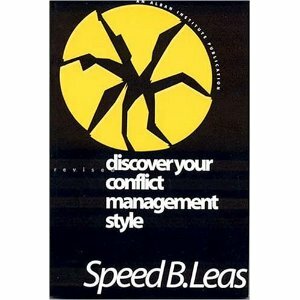 The book is another Alban Institute publication, this one entitled: "Discover Your Conflict Management Style," by Speed B. Leas. It includes a conflict style assessment tool that sorts out your conflict management preferences into a six-category typology of conflict management preference, and then lays out what each of those different categories means for how we manage disagreement. Plus Side: His name is Speed. This is, in and of itself, awesome. He's a demon on wheels, baby. Plus Side: The self assessment tool included with the book is useful. It's always helpful to have an interactive component to teaching any concepts, and being able to see where your preferences lie relative to what's being presented helps reinforce it. Knowing that you tend one way and that you've got approaches that you actively prefer really does help grasp how you're going to act...and whether that tendency is constructive. It would be easy to skip through a book like this assuming you aren't ever going to deal inappropriately with a disagreement, and nodding your head at the wisdom without realizing you don't ever put that into practice. The assessment tool is a good reality check. Plus Side: The core typology of conflict management being presented is logical and feels complete. Each of the six approaches to conflict make sense, reflecting the spectrum of how we tend to deal with the stuff that could...or does...divide us. They do occasionally blur into one another, and occasionally it seems that one category has morphed into two or more, but so it goes. Approaching conflict in this way seems generally constructive. Leas has laid out a solid set of criteria, and they really are helpful in getting your head around this issue. Negative side: Layout Matters. If what you're doing is writing a story, or an essay, this matters not. But this isn't a book book. It's only 30 pages long. It has sections you're supposed to write in and mark up. It's a workbook. And as a workbook, it needs to own its workbook-ness. If the first exercise you want folks to do is at the back of the book, and there's information you don't want them to get to until they've done that exercise, well, put the exercise first. Or put it right after the introduction. It feels clumsily assembled. That sense of structural awkwardness is reflected in the conflict inventory, which really does feel like it was laid out in WordPerfect back in 1996. It continues elsewhere, as the categories blur into one another, as individual sections seem to start arbitrarily, with few visual cues that you've just transitioned. It's not critical, but when you find yourself working around the awkwardness of a layout as you navigate and score an assessment instrument, it doesn't lend confidence. It could use some editing, and a reprint after a graphic designer has gone over it for usability. Negative side: Conflict Context Matters. As I worked my way through the questionnaire that was assessing my conflict management style, I found myself struggling a bit. I'm aware that while I'm far from perfect in dealing with conflict, my own responses to disagreement tend to depend on the nature of that disagreement. Are we working through divergent options for a new worship schedule? Then I'm going to be "collaborative." Am I discussing the right of women to be ordained leaders in the church? Then I'm going to be "persuasive." Am I dealing with someone who has been sexually harassing another congregant? Then I'm going to be "compelling," in the way that a man-portable rotary cannon is compelling. The booklet recognizes this in the narrative sections, and notes the ways in which different styles and approaches can be appropriate. But I found myself longing for an instrument that somehow integrated this into itself. One possibility would be laying out short descriptors of conflict situations of varying degrees of intensity, and then having the respondent answer questions based on that context. That would help assess whether you're able to read a conflict environment well enough to apply an appropriate strategy. Trying to be "collaborative" in an intractable stage 5 conflict, for instance, would be an exercise in futility. This booklet is, ultimately, a useful tool, even if it's a bit frayed around the edges. Though it comes out of a publishing house that focuses on church issues, it's not really a "faith" book at all. Unlike other lightly baptised organizational literature, it makes no effort to position itself as church-focused. I appreciate that. It's just a general guide to dealing with disagreement and the messes of organizational life.